This Lobbying project of DIWA has two objectives. 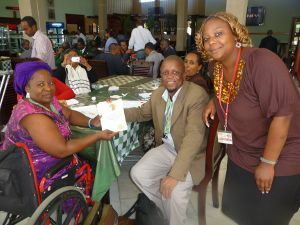 The first is to network on an pan-African level and to encourage unity of purpose in order to empower disabled women to effectively advocate and lobby for their human right to life. The second objective is to raise awareness of the African Union, National Governments, NGO’s, Development Agencies and other services, working in the area of HIV/AIDS, that disabled women are on the one hand at special risk and on the other hand excluded from many of their services. The overall aim was to encourage all these bodies to mainstream Disability and Gender. The project was funded by ABILIS.